While legal recognition of marriage has met the needs of a segment of the LGBTQ population, many still face daily struggles with issues around housing, education, healthcare, policing and incarceration, and immigration. These are issues that were largely eclipsed in national arenas by the fight for marriage equality.In reaction to this, The Unfinished Queer Agenda After Marriage Equality examines the institutional failings and overlapping systems of injustice that continue to dehumanize queer and trans people and deprive them of basic human rights. Building on a major conference held in 2016 entitled "After Marriage: The Future of LGBTQ Politics and Scholarship", the editors have collected academic papers, edited transcripts of selected conference sessions, and interviews with activists. Drawing from this source material, the book argues that any queer agenda should be informed by an understanding that the issues facing queer and trans people come from the combined influence of neo-liberal capitalism, global white supremacy, and heterosexism. The authors argue that these modes of oppression continue to be especially damaging for poor people, undocumented people, people of color, non-binary, trans, and queer people. By taking an in-depth look at the myriad social issues that continue to affect LGBTQ communities, and by exposing systemic prejudices and inequality as the root cause, this title is an important intervention for students and researchers engaged with queer and trans activism, beyond the fight for marriage equality. "The Unfinished Queer Agenda after Marriage Equality is a much-needed corrective to contemporary declarations of 'LGBT equality' that cover up the struggles of queer and trans people facing poverty, criminalization, and immigration enforcement. This book is an important resource for anyone who wants to understand the fight for queer and trans liberation." 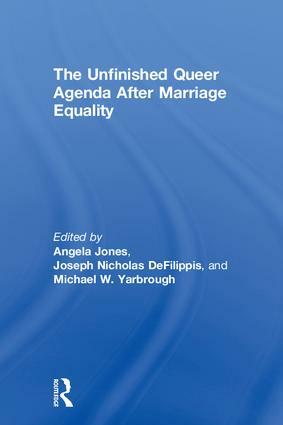 "The Unfinished Queer Agenda after Marriage Equality analyzes remaining injustices for disenfranchised groups within the LGBTQ community, such as the young and immigrants, and argues that equality involves transforming economic, political and social structures that are untouched by marriage rights. This accessible, engaging book provides a clear direction for LGBTQ activism." Chapter 1: What is "the Queer Agenda? Jennicet Gutiérrez, Steven Thrasher, Paulina Helm-Hernández, Greggor Matson, Salvador Vidal-Ortiz, Terry Roethlein, and Angela Jones. Angela Jones is Associate Professor of Sociology at Farmingdale State College, SUNY, USA. Her research interests include African American political thought and protest, gender, and sexuality. Jones is the author of four books and numerous scholarly articles in peer-reviewed journals. Joseph Nicholas DeFilippis is the founder and former Executive Director of Queers for Economic Justice and worked as an activist for over two decades. He is currently an Assistant Professor of Social Work at Seattle University, USA and has written about queer social movements, poverty, and marriage politics. Michael W. Yarbrough is an interdisciplinary social scientist whose work explores the intersection of law, culture, and family. He is Assistant Professor of Law and Society in the Political Science Department of John Jay College of Criminal Justice (CUNY) USA, and Research Associate in the Department of Sociology, Faculty of Humanities, at the University of Johannesburg, South Africa.